This is the true story of one of our own employees, and how she got her own perfect proposal with a custom ring! Rob and I matched on Tinder. He slid into my DMs like no other! After a few friendly exchanges, we decided to meet in person. Rob invited me over to his place for a drink (he makes a mean mint julep). Our connection was so instant we decided to get lunch a few days later. The rest is history! Rob and I planned a trip to LA for my 27th (and golden) birthday with four of our friends. We started the weekend with a scenic hike at Runyon Canyon Park. Little did I know there would be more than awesome views in-store for me at the top! I was determined to get the best photo with my beloved selfie-stick. Once we reached the highest point, Rob offered to use his phone for the shot. He grabbed the selfie-stick and appeared to fumble. 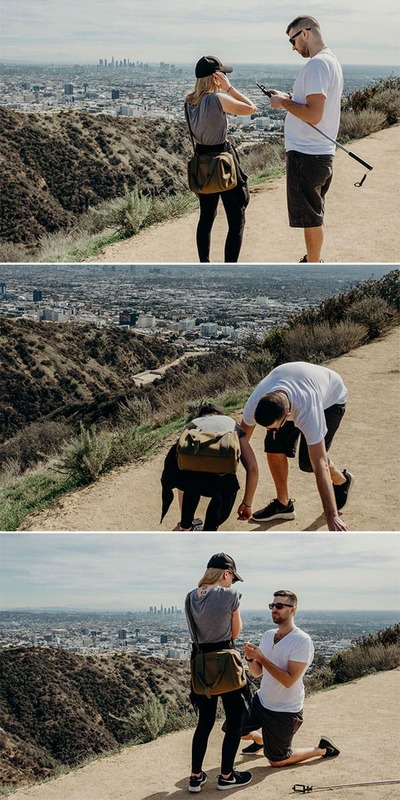 As he dropped his phone, he got down on one knee and pulled a ring out of his pocket! My legs became instant jello. After what seemed like an extremely long moment, I said yes! I work at Forever Companies so I am inspired daily! I see so many beautiful designs; I fall in love with new things all the time. 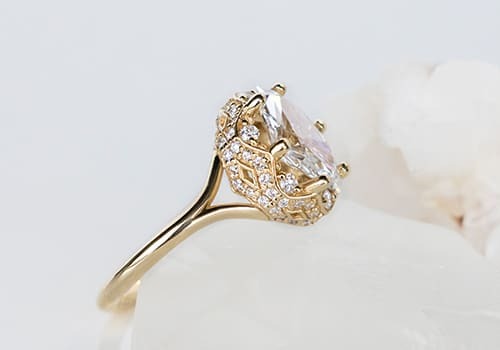 I’ve always had eyes for the Nottingham Engagement Ring from Diamond Nexus. 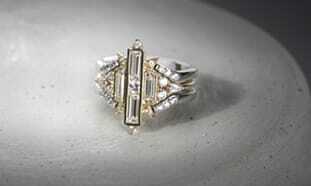 But I also wanted a pure carbon lab diamond from 12FIFTEEN Diamonds, and I knew I wanted a Marquise cut center stone. Lucky for Rob, he was able to sleuth this idea from my coworkers, and then Rob worked with our designers to customize the ring perfectly! Did we meet all of your expectations from designed image to finished piece? Rob really enjoyed working with the team at Forever Artisans. Even though the vision of the finished piece was very clear, there were still some decisions that he needed to make. They were supportive every step of the way. 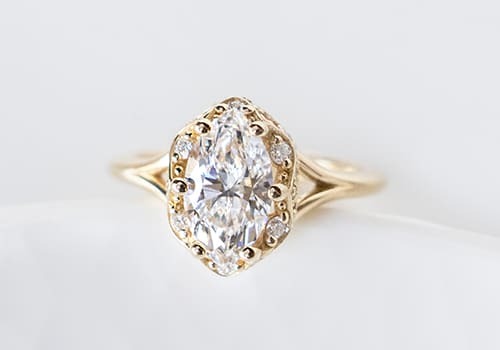 I can only speak for the finished piece but Forever Artisans, without a doubt, crafted the ring of my dreams! Want to see more Design Stories?